Let me tell you about the time my mother could have been the exact inspiration for both the Michael Jackson song and the Weird Al version. Mom didn’t usually resort to extreme measures of punishment in our house but once in a while she’d come up with something I didn’t expect. I think she probably read about such ideas in Ladies Home Maternal or someplace. Mom was a sucker for whatever was the latest in “pop psychology” and I, being a very observant and astute kid, was always aware when she was attempting a new strategy. This particular day she served me dinner with the beets already on the plate and the juices were seeping into all the other food. She poisoned my mashed potatoes with beet juice! And I could taste it in my meatloaf too. This, I decided, was completely unacceptable and I announced that I was not going to eat dinner that night. So Mom tried out her latest parenting technique and told me I could not leave the table until I ate all my dinner including the beets. There I sat: 5:30, 6:30, all the way to 7:45 which was only 15 minutes until bedtime. I finally got up from the table and went off to bed wondering if I could have gotten away with leaving the table any earlier than that. Looking back, I think, “Yes.” My mother was certainly not a harsh disciplinarian. I’m not into pop psychology or any other kind of psychology. So don’t bother to analyze this or guess that this is the reason I have hated beets all my life. It’s not. They really do make me gag and I don’t care why. 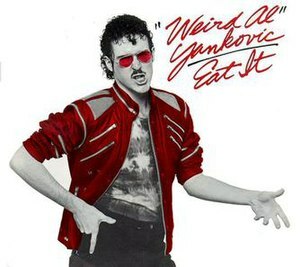 But I sure did get a big kick out of that Weird Al song when it came out! And now that I’ve been trying beet recipes to see if maybe I could find and enjoy the right preparation of them, I just keep singing a hybrid of that song and moonwalking across the kitchen floor! Beet It! Eat It! . . .
And being very rebellious and self-determined when it comes to beets, I’m not even going to look up any recipe. I’m going to concoct it myself and I’ll have only myself to blame if I have to sit at the table for hours because they are inedible. But at least I’ll taste them and take a picture so I have a blog post for today. Preheat the oven to 400 degrees. Toss the beets, carrots and whole garlic cloves in a bowl with some olive oil, salt and pepper. Toss the fennel bulb pieces in another bowl with olive oil, salt and pepper. Place the beet, carrots and garlic in a single layer in a shallow baking pan and put it in the oven. After about 15-20 minutes, take a spatula and turn the pieces so they get roasted on another side and add the fennel. In another 10 minutes turn the fennel. The veggies are done when they are browned and tender but not mushy. About 30-40 minutes altogether. When the roasted veggies are done, put them into a bowl and mix a little cinnamon in them. While the veggies are roasting, wash the kale and separate the stems from the leaves. I save the stems and do eat them but I’m not including them in this salad. Bring a large pot of water to a rolling boil with a pinch of salt and cook the leaves for about 2 minutes. They should be tender enough to eat but still bright green. (Remember this is supposed to be a salady dish.) When you take the kale out of the water, put the leaves on a big plate or some other flat dish in a single layer so they can quickly cool. If you put them all bunched up in a bowl the heat will cause them to continue cooking and they won’t be bright and beautiful anymore. Stack the leaves on top of each other, loosely roll them and gently squeeze any excess water out of them. Mix up the dressing: olive oil, mustard, lime juice, apple cider vinegar, salt, pepper. Shake it up so it emulsifies. [stays mixed together and suspended rather than separate] Adjust the ingredients and seasonings to taste. It’s your choice on the serving technique. You can make a bed of whole kale leaves and put the warm veggie salad on top or you can cut the leaves up which will make them easier to eat and use them as a bed in individual salads. Arrange the veggies over the kale and drizzle on the dressing..
Now Eat It! Just Eat It! The mustard dressing turned out to be a great choice for the roasted beets. 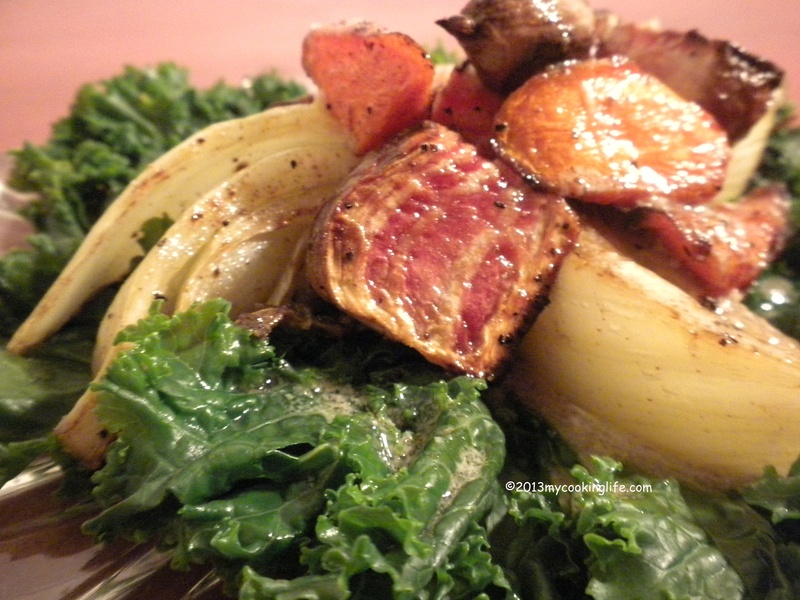 This entry was posted in Cooking, Recipes, Vegetables and tagged beet recipe for people who hate beets, beets, Michael Jackson, roasted beats, the 1950's, Weird Al by mycookinglifebypatty. Bookmark the permalink. I love your beet odyssey! You are brave! Great minds think alike, I have that “just beet it” as title for that long-promised-yet-to-be-posted beet recipe. Now what do I do? Hmmm. You’re probably a lot younger than me and wouldn’t remember this song, but Cher used to be married to a guy named Sonny Bono and their singing act was “Sonny and Cher.” One of their first hits was “The Beat Goes On!” Thanks, Azita, for the generous comments! I’m looking forward to your beet post and I’m going to try what you come up with. We both had beets on our minds this month! Yes! We are on the cutting edge! Thanks for the link, Jovina! Barry and I are laughing hysterically. He just said he’s going to remember to tell his ice fishing partner about that joke about them walking into the bar. Ha ha! He loves pickled beets. I am less fond of them, but may have to try your recipe. It looks good! If you think that was funny, you shoulda seen me moonwalking! I’m with you, not a beet fan ~ will only eat them if they are served as a side dish at a restaurant. You’re brave! I have never ordered them at a restaurant.